CNN sets 9pm try-outs: four possibles start 3/28. 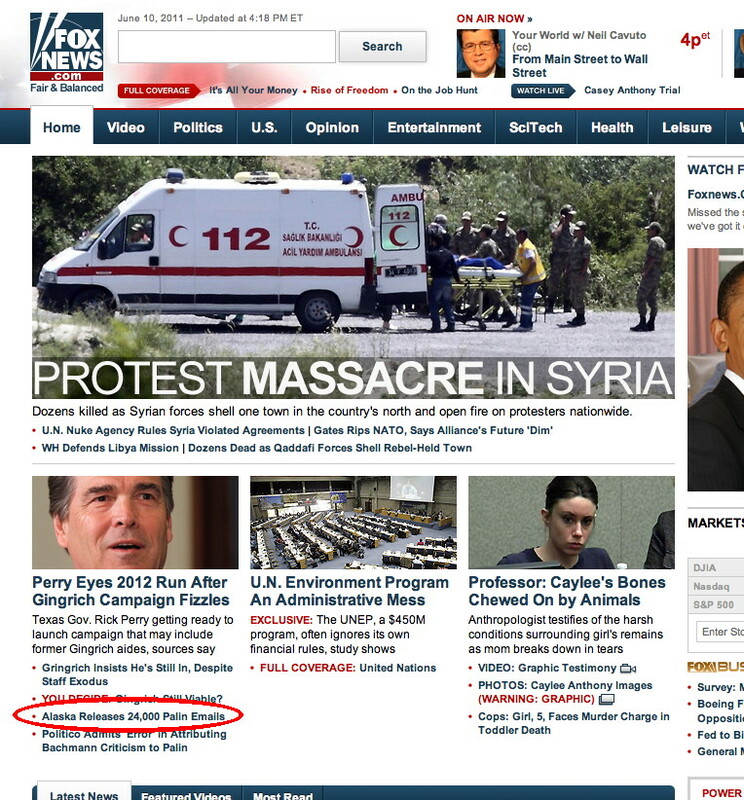 Fox News tops rivals for Harlem explosion coverage. Wemple: Ed Schultz confused as time marches on. Mirkinson: Malaysia mania is Poop Ship redux. More. GOP Presidential poll includes two cable news hosts. CNN’s celebrity chef headed for Russia, Punjab, etc. O’Reilly and Chris Matthews inducted. Holt honored. Kogan: Chicagoland has questions, but few answers. Bury: Despite a silly title Chicagoland got my attention. Cable news swells named special guests at nlgja benefit. After the Buzz video: Palin slams the media. AJAm’s app. Media Buzz videos: Liz Cheney, Martin Bashir. Reliable Sources videos: Bashir, BuzzFeed, race. Video: Sarah Palin reacts to Martin Bashir smear. Sunday talkers: turn the table, HuffPost recap. Goldstein: How we will know if Bashir is sincere. Carl Cannon: Is it time to pull the plug on MSNBC? Zurawik: Fox News best JFK coverage, MSNBC worst. Is Baldwin’s suspension over? Grove: Don’t fire Bashir! Your Buzz videos: Garry Trudeau, Alec Baldwin, Bashir. 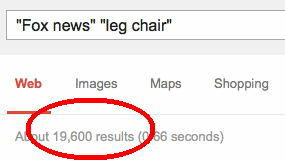 Huge Folkenflik scoop: Fox has a leg chair. Who knew? Scarborough: Ghostwriter helped draft Bashir apology. Kurtz: Palin cancels Lauer interview to protest Bashir. Bauder: MSNBC stonewalling questions about Bashir. Video: Ralph Peters on the Afghanistan ‘Vanity Project’. Golub: Why MSNBC is failing...‘lack of professionalism’. Somerby: O’Reilly airs more diverse views than MSNBC. Surprise: CNN co-host gets Presidential appointment. Coop re-ups with CNN. Smith: MSNBC may dump Alec. Arceneaux: ‘Token’ Don Lemon is a lot like Sarah Palin! Wolcott: Going on MSNBC like talking with superheroes. Factor video: Bernard Goldberg on the ‘Knockout’ game. Journalism: Four cablenewsers fall for fake tweeter. More. Reliable Sources videos: Tapper, Palin, and more. Ailes supports Kennedy. Bill Hemmer: back to school. Fox News Watch video: CNN’s latest GOP debate. Douglas Kennedy charged; no change in his job status. VIdeo: A surprise appearance in the Beverly Hills Watters’ World. Joe & Mika back Pat, buck MSNBC brass: ‘We strongly disagree’. The Death Network skeds wall-to-wall Whitney weeping. More. Q&A: Don Lemon, Sarah Palin. Profile: Big Ed Schultz. Guthrie: Pat Buchanan’s ‘crazy politics’ led to his firing. Zurawik: Good riddance! Stelter: Pat didn’t change, MSNBC did. Kurtz: Next stop, Fox News? Bartiromo: bored or burned-out? Today’s suspension demand. Claim: Roger Ailes came close to pulling Palin off the air. CNN, AEI, and Heritage prep for debate. Kurtz backs Bill. Meghan McCain: deja vu all over again. Hot & Not: Now, Romenesko, Shapiro, Behar, Politico etc. ‘Reporter’ brags he inserted anti-US agit-prop in Fox News segment. Blogger outraged that FNC hired someone she disagrees with. Andrea Mitchell’s cancer announcement. MSNBC preps for debate. Profile: Shannon Bream. Q&A: Wolf Blitzer. Weekend numbers. Video: Ed Henry talks with Don Imus about 9/11. Terminate the ticker! Finally! Your chance to slaughter Bill O’Reilly, Sarah Palin, and Brit Hume! 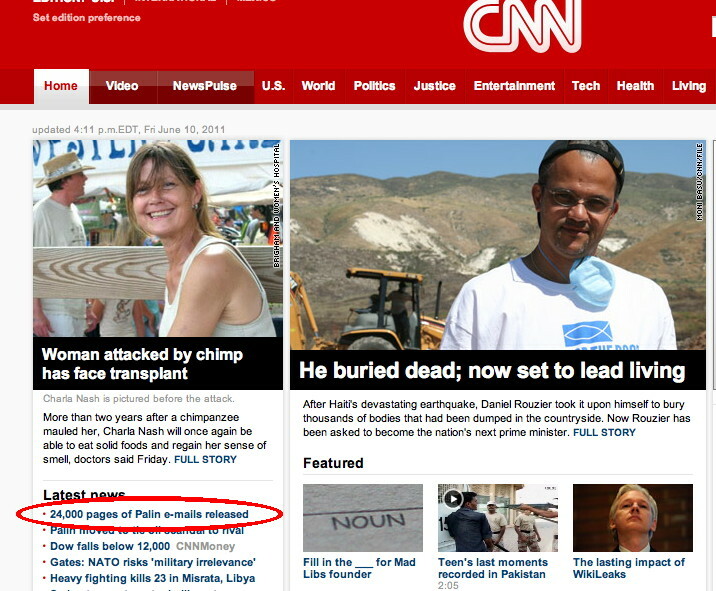 Palin: front page news? Compare: CNN, FNC, MSNBC. Video: Bias Bash on searching for Palin email dirt. MSNBC anchor headlines LGBT event. Kirsten vs Maddow. Fralic: Why Anderson Cooper should stay put. CNN preps for GOP debate. Sunday Stossel special. 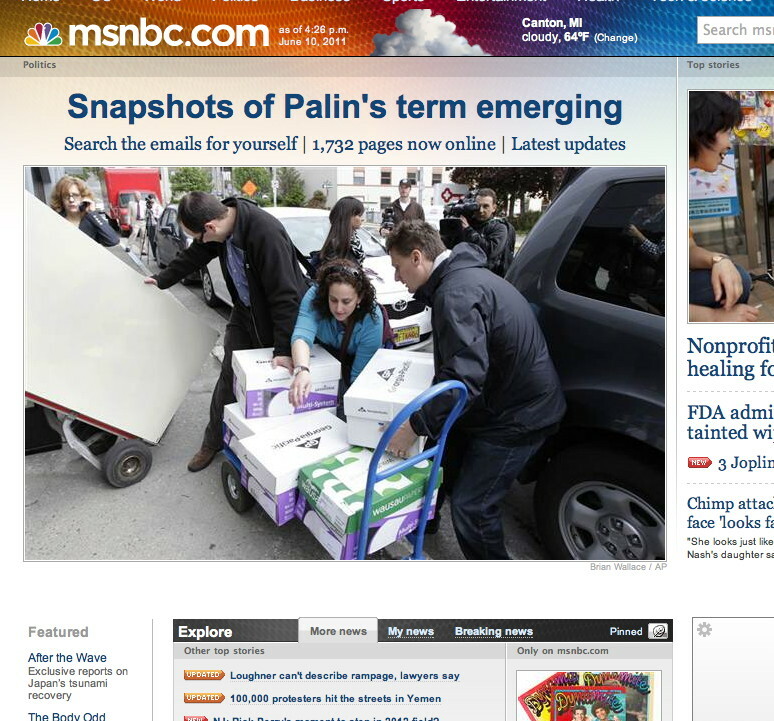 MSNBC teams with Mother Jones to scour Palin emails. Zurawik: Weiner show made for a great afternoon of cable news. Ali Velshi gets 5:00 am CNN slot. Chuck Todd goes solo. Lori Rothman on the fiscal crisis. Q&A: Stuart Varney. Roger Ailes responds to media hit-pieces; more. Will we see a new Ed? Demi Moore hosts CNN doc. Fox flaunts faux Fey photo for Sarah Palin...Sorry! June 6 1944. Why did MSNBC sideline Savannah Guthrie? Zurawik: Palin will be the downfall of Fox News. Video: Reliable Sources on Palin’s media strategies. Fareed special focuses on innovation. Video: News Watch on Sarah Palin’s media relations. Greg Gutfeld answers 21 questions. Mrs Piers pregnant. HLN: More Grace. Q&A: Don Lemon, Nancy Grace. Memorial Day numbers: O’Reilly-Bream-Gallagher (FoxRprt) 1-2-3. Video: Bias Bash asks if war reporters are too invested in war. May program rankers. Fox & Friends #1 for 115th consecutive month. HLN sinking. May spin: CNN, MSNBC. Video: Trump talks about the Palin pizza powwow and more. Q&A: Jeff Flock on FBN’s new Merc studio. CNN’s dark Tuesday. Fox News debuts iPad app. Loopholes in Palin’s FNC contract? Coop goes up close and personal...with Coop. MSNBC a swamp of sexism? Can Big Ed change? 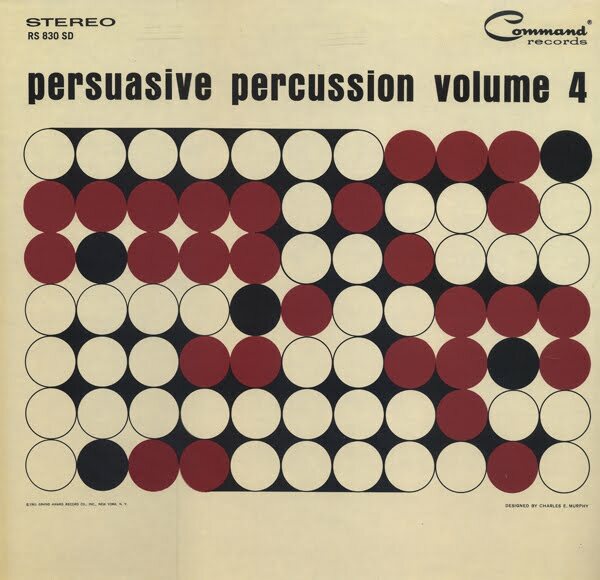 Q&A: Gerri Willis. Profile: Lawrence O’Donnell. Palin still working for FNC, for now. Video: Laura Ingraham reacts to Schultz attack/apology. Blowback: Ailes backs Palin, slams anonymous GOPer. Bias Bash video: Netanyahu, ABC spikes interview, etc. Jon Scott: My son, the West Point graduate. VIdeo: Trump sez he still hasn’t ruled out Prez run!?! Janice Dean returns. Gasparino’s day. CNBC goes Hollywood. Hot & Not: Feist, Licht, Spitzer, etc. Steele signs w/MSNBC.